Some tips and tricks to help you plan a long term motorcycle trip. We get a lot of questions about how we planned such a long trip. 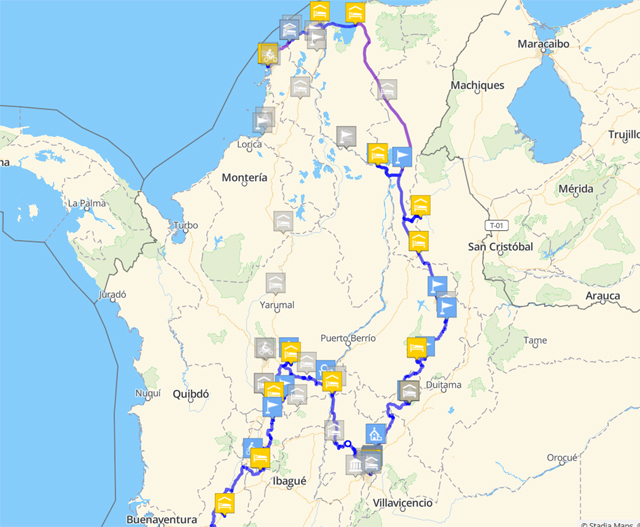 We figured out a good system to plan our ride through the Americas, and it was tweaked and adjusted over the course of a year. The first thing we do is go to Furkot.com. Furkot is a free route planning tool that has a surprising amount of depth. It allows you to create as many maps as you need. You can set waypoints by address or GPS coordinates, and you can set how long you stay at each one or if they are an overnight stop, as well as setting icons for what each stop is. In the example above, you can see Hacienda Napoles, the drug kingpin's compound turned theme park in Colombia. 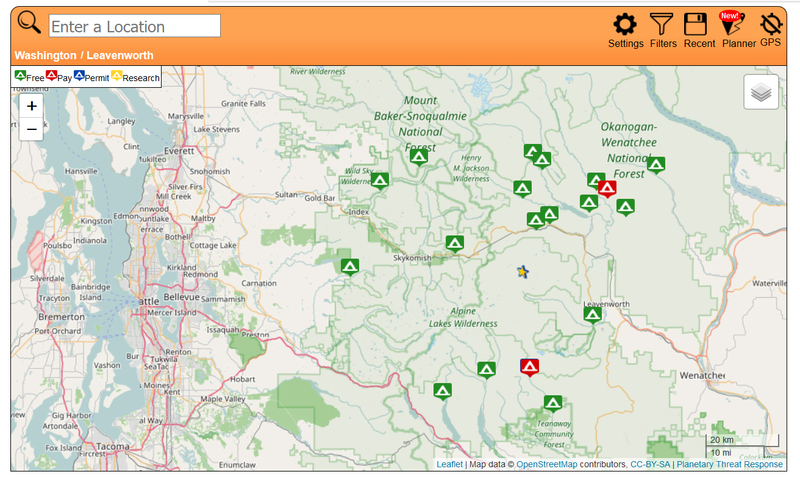 It's highlighted on the top right, and the corresponding icon on the map inverts colors to help you find it. Beneath it on the list, you can see the departure time, distance, and estimated arrival time based on set speed and route. The overnight stays are yellow, and the order can be dragged and dropped to adjust your route as you see fit. Each map allows you to set times you want to travel each day, the fuel range of your motorcycle, the average speed you want to travel, highways, tolls, temperature, miles or kilometers. 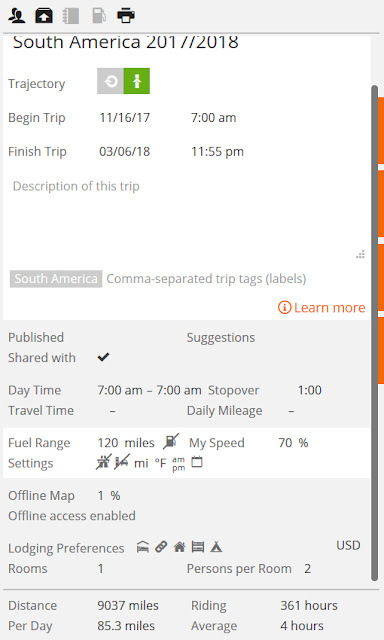 You can always check the trip tab to see/adjust all of these, as well as the total distance, miles per day, amount of total hours riding and daily average. You can also export your map in a variety of file types. We didn't carry a GPS, but just loaded the maps into google maps or maps.me on a phone and never had any issues. There is a ton to learn in Furkot, but it's far more than we can write in here. It's free to use and once you're used to it, it becomes an invaluable tool for route planning. We like to visit lots of wacky/spooky/mysterious places on our travels, and one of the first resources we consult is Atlas Obscura. They have an excellent map to help you narrow down the area you're visiting, and it can also be filtered through the FIND section of your furkot map. On any long term trip, you're likely going to be camping quite a bit. In the US, even that can get expensive. One of the first places we check is freecampsites.net. It's not always the best, and can sometimes be catered more towards RV campers (there are a lot of walmart parking lots that don't really work for motorcycles), but we've found a number of great campsites that we wouldn't have known about otherwise. Similar to freecampsites, but much more focused on international overlanders. This site has gotten a lot of use on our travels. Hopefully these are good starting points if you wanted to plan a long term trip, but weren't sure how. We're using this strategy now to plan our next trip for Summer 2019. As a final note; it's important to plan, but also important to be flexible. Don't book too many things in advance, as you never know what might happen, and you have to be ready to adjust to whatever comes.